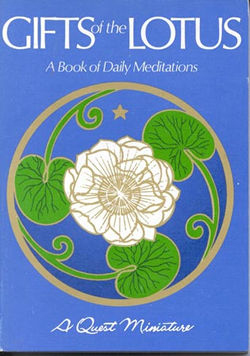 Here are three-hundred and sixty-six meditations-one for each day of the year-each from the heart of a spiritually oriented philosopher from Plato to Emerson to Sri Aurobindo to a host of theosophical students and scholars. Inside of this miniature Quest book is a complete philosophy for living; quiet, short, engaging thoughts, each alive with the spirit of being. In truth this is not a book to be studied. It is a book to be carried in the pocket or purse. It is a book to be treasured. Julia Jewls Hanson is a master healer, speaker, channel, and ordained minister in spiritual science. She has studied and taught metaphysical science for over 25 years. Awakened early in 1981, Julia was enlightened to higher consciousness by the angelic realm. She communicates telepathically with ascended masters and the angelic realm. She has dedicated herself toward sharing this knowledge and her gifts in an effort to assist in the awakening process and healing of others. Julia uses her knowledge and abilities to restore the body, mind, and spirit through personal and past life readings and vibrational healing techniques. She especially enjoys working with Indigo and Crystal children - helping them understand and develop their special gifts. Julia currently resides in Austin, Texas, with her husband, Jim, dog Baxter, and 2 cats. She spends most of her time communicating with her guides, working with clients, and traveling around the country to speak at metaphysical conferences. Her active and interesting life has put her on many paths over the years, including being a world class gymnast, a nationally placed diver, equestrian show horse jumper, member Children s Hospital Of Austin Auxiliary Board, fundraiser for the Children s Miracle Network, and Vice President of two successful companies. She has been interviewed on radio and TV and has an Associate Paralegal Degree.